Just a week to go… Spread the word – and cross all fingers for good weather at BA4 6PY! Nine gardens this year, including in No Through Road – by popular demand – Gert Schley’s lovely garden, which proclaims his lifelong experience of and love for everything horticultural in every leaf and twig, at the same time demonstrating how organic principals can supply a feast for both body and soul. Next to him is Charles Dowding’s prolific no-dig, organic vegetable garden – a true educational experience and if that’s all too much to digest, you’ll be able to get tea and cake across the road at White Chimneys to sustain you. At the other end of the village and new this year, are Mill House (another tea and cake stop!) with its hydro turbine – that some of you may have seen before, but worth another look – and just over the bridge on the Ditcheat road, our local celebrity racing trainer is generously allowing us a snoop too – though the sensible man will be absent himself. Between the two extremes are another five individual and contrasting gardens, each and every one worth a look and a little envy. ….STOP PRESS…. I’m told that Gert will be selling both plants and surplus garden tools too! 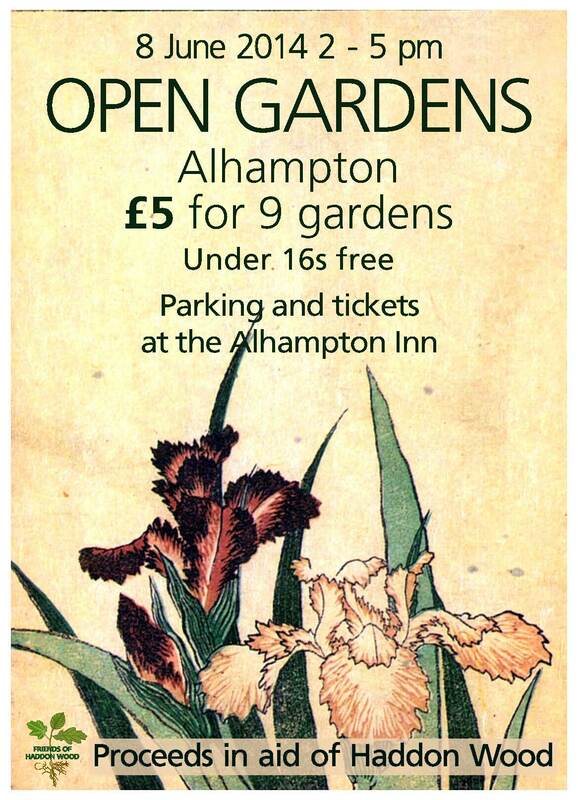 Categories: Alhampton, Events, Gardens | Tags: Alhampton, Haddon Wood, Open Gardens, The Manor | Permalink.